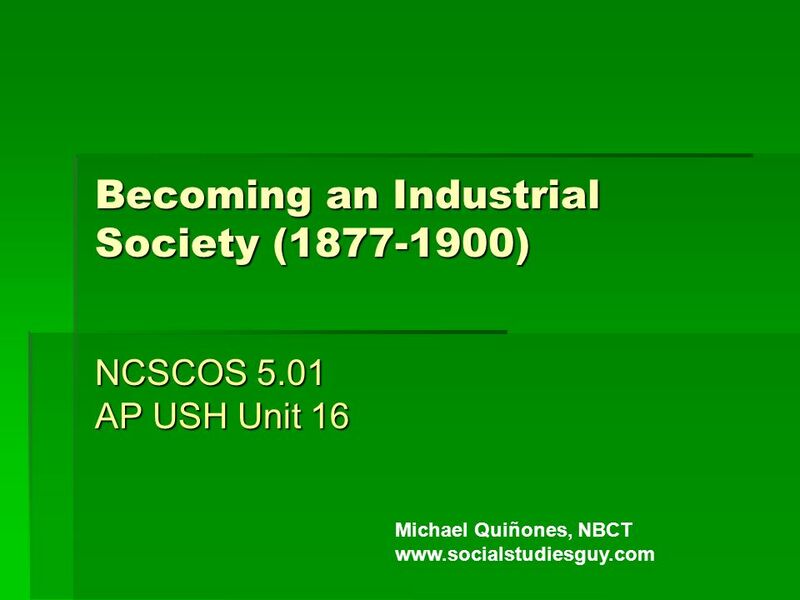 Becoming an Industrial Society (1877-1900) NCSCOS 5.01 AP USH Unit 16 Michael Quiñones, NBCT www.socialstudiesguy.com. 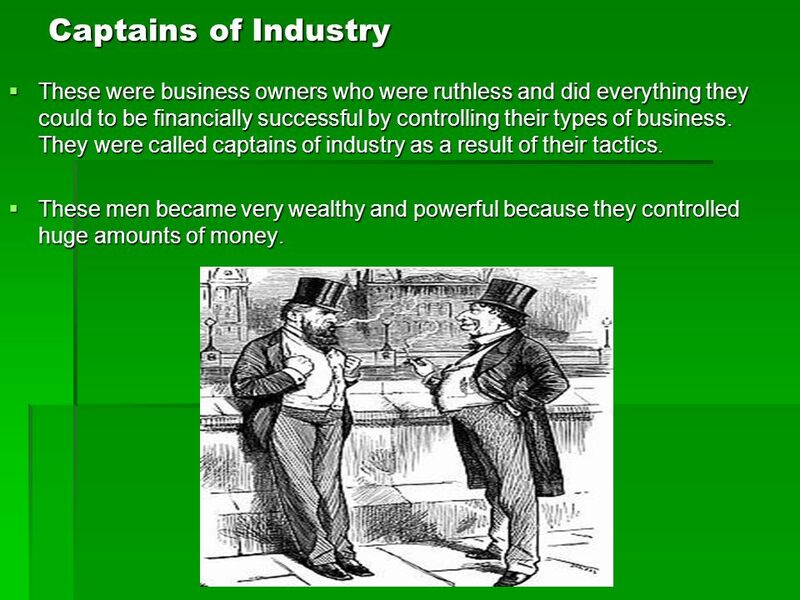 4 Captains of Industry These were business owners who were ruthless and did everything they could to be financially successful by controlling their types of business. They were called captains of industry as a result of their tactics. These were business owners who were ruthless and did everything they could to be financially successful by controlling their types of business. They were called captains of industry as a result of their tactics. These men became very wealthy and powerful because they controlled huge amounts of money. These men became very wealthy and powerful because they controlled huge amounts of money. 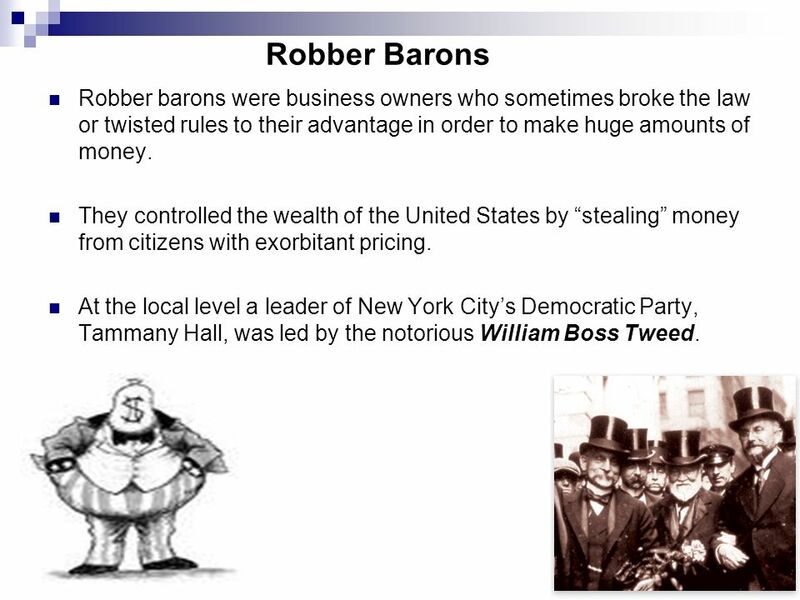 5 Robber Barons Robber barons were business owners who sometimes broke the law or twisted rules to their advantage in order to make huge amounts of money. They controlled the wealth of the United States by stealing money from citizens with exorbitant pricing. At the local level a leader of New York Citys Democratic Party, Tammany Hall, was led by the notorious William Boss Tweed. 6 John D. Rockefeller and Standard Oil Rockefeller built on the success of Drake and went into the oil business. 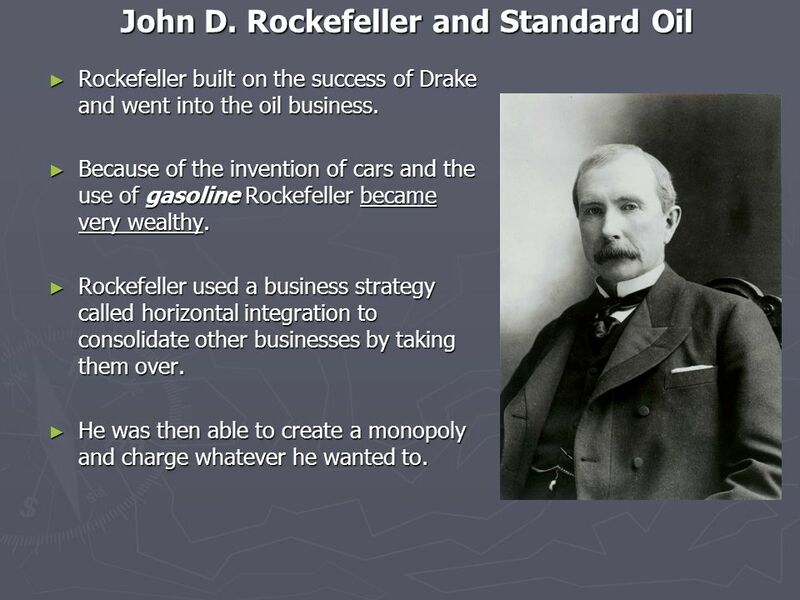 Rockefeller built on the success of Drake and went into the oil business. Because of the invention of cars and the use of gasoline Rockefeller became very wealthy. Because of the invention of cars and the use of gasoline Rockefeller became very wealthy. Rockefeller used a business strategy called horizontal integration to consolidate other businesses by taking them over. Rockefeller used a business strategy called horizontal integration to consolidate other businesses by taking them over. He was then able to create a monopoly and charge whatever he wanted to. He was then able to create a monopoly and charge whatever he wanted to. 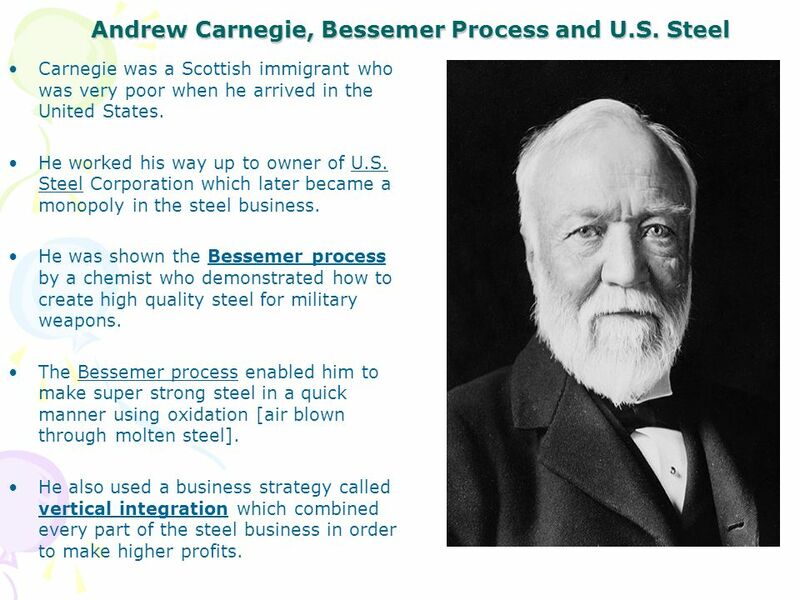 7 Andrew Carnegie, Bessemer Process and U.S. Steel Carnegie was a Scottish immigrant who was very poor when he arrived in the United States. He worked his way up to owner of U.S. Steel Corporation which later became a monopoly in the steel business. He was shown the Bessemer process by a chemist who demonstrated how to create high quality steel for military weapons. The Bessemer process enabled him to make super strong steel in a quick manner using oxidation [air blown through molten steel]. 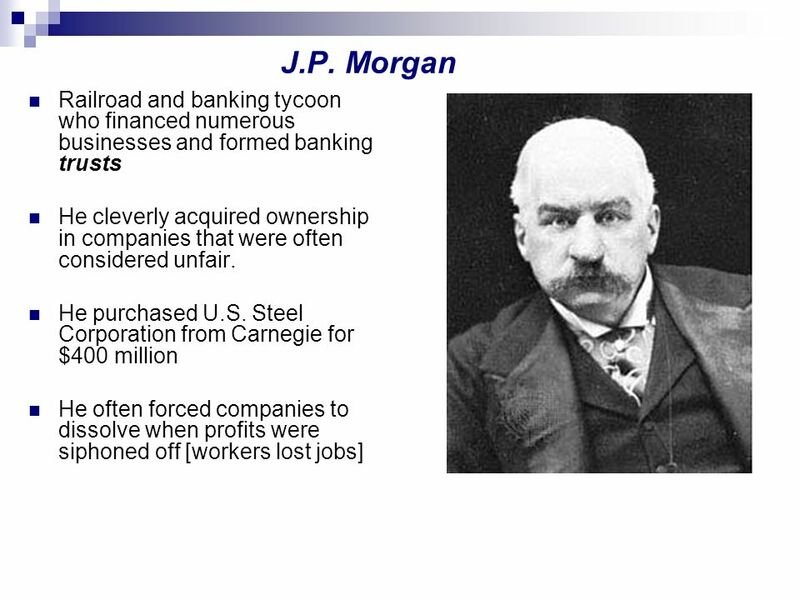 He also used a business strategy called vertical integration which combined every part of the steel business in order to make higher profits. 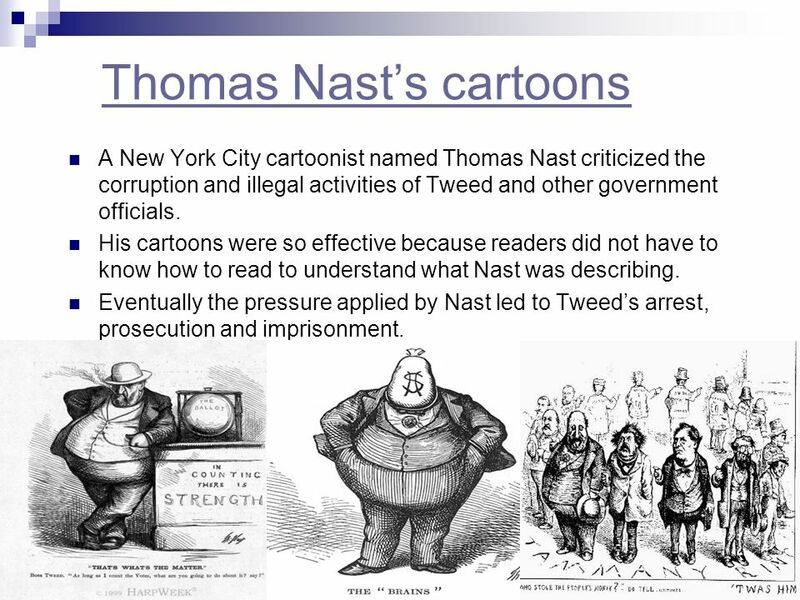 9 Thomas Nasts cartoons A New York City cartoonist named Thomas Nast criticized the corruption and illegal activities of Tweed and other government officials. His cartoons were so effective because readers did not have to know how to read to understand what Nast was describing. Eventually the pressure applied by Nast led to Tweeds arrest, prosecution and imprisonment. 10 FRQs: Free Response Questions 1. 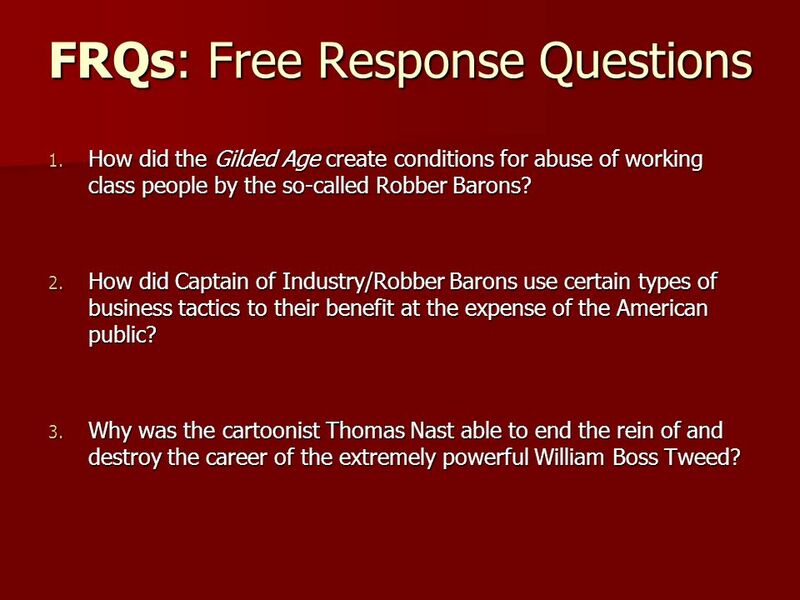 How did the Gilded Age create conditions for abuse of working class people by the so-called Robber Barons? 2. How did Captain of Industry/Robber Barons use certain types of business tactics to their benefit at the expense of the American public? 3. Why was the cartoonist Thomas Nast able to end the rein of and destroy the career of the extremely powerful William Boss Tweed? 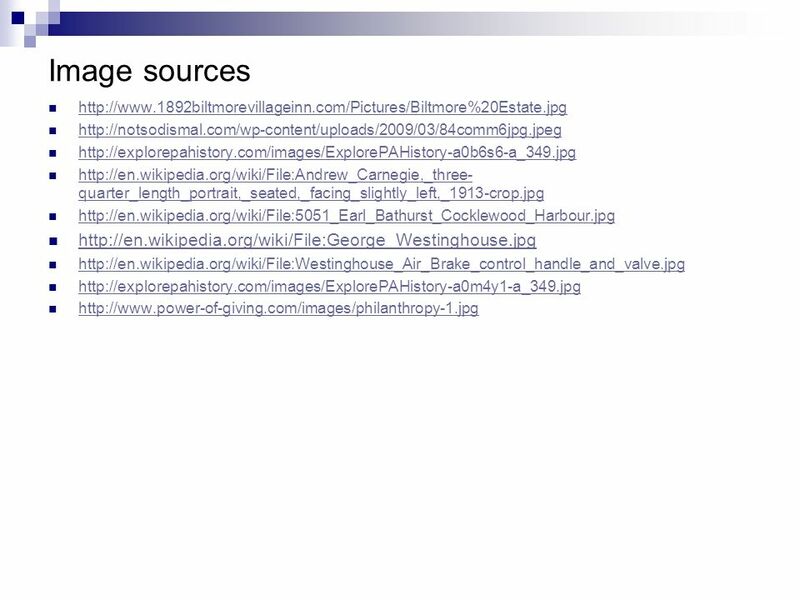 Download ppt "Becoming an Industrial Society (1877-1900) NCSCOS 5.01 AP USH Unit 16 Michael Quiñones, NBCT www.socialstudiesguy.com." Unit 1: The Gilded Age Industrialization. Have you ever used any of these products? What company created these products? Who was the man behind the creation. LT: I will be able to identify entrepreneurs during the Industrial Era and show knowledge of how a market economy works. BW: List 3 New inventions or industries. The Growth of Big Business The Rise of Big Business. Warm-Up 4/10 If you could be the owner of any type of company, what would it be? Why? Directions: Check + add to your HW assignment (which was due Wed/Thurs. Aug ) Unit #1 Gilded Age Vocabulary Review. Monopolies, AND Trusts. A Monopoly: What Is It? A single seller of a product (good or service). –Monos: single, alone –Polo: to sell Lack of Competition. Monopolies AND Trusts. 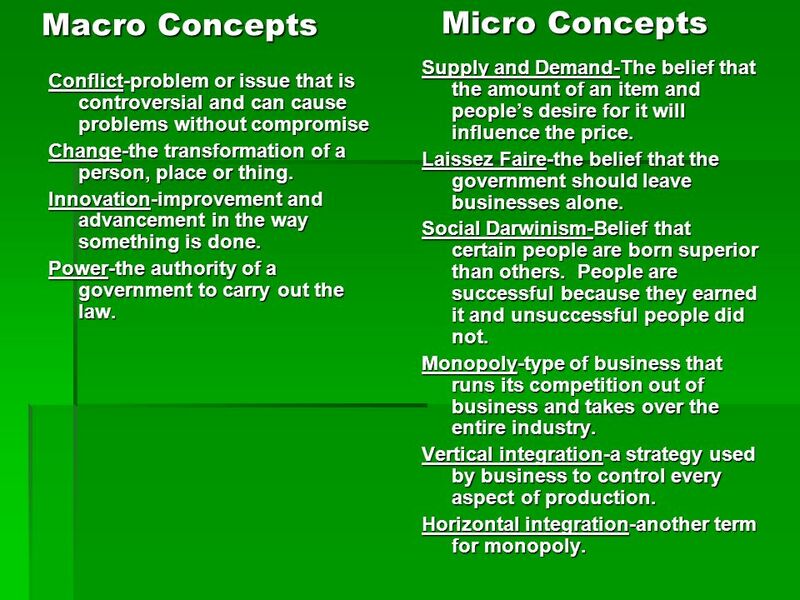 What is a MONOPOLY? A single seller of a product (good or service). –Monos: single, alone –Polo: to sell Lack of Competition means. 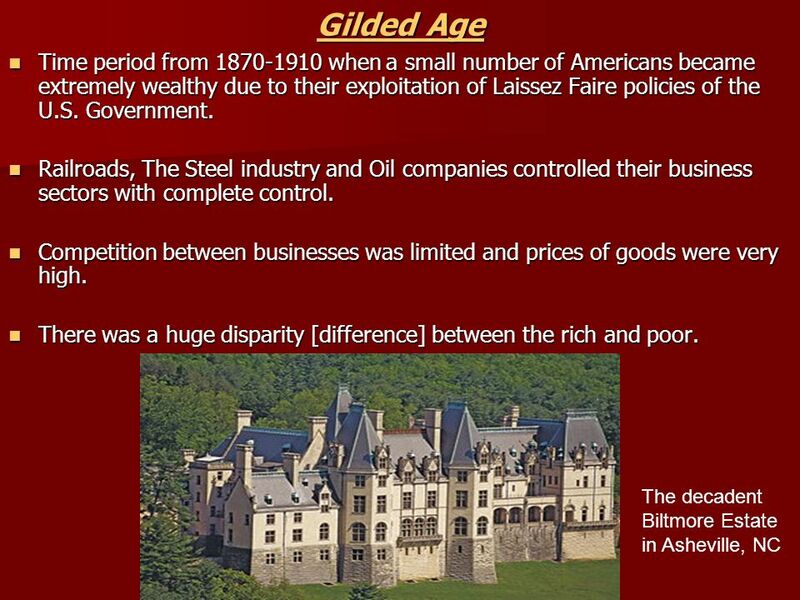 Aim: Why were the late 1800’s referred to as the “Gilded Age”? Industry and Business Late 19 th Century US History.